Some breakouts just seem to keep knocking on our door, and as much as we try to shut them out with a consistent skincare regimen, we just can’t seem to avoid those pesky pimples. Acne that keeps flaring up in certain locations may have internal causes linked to factors that are plaguing our bodies. When your acne won’t keep quiet, it might be time to listen to what they’re trying to tell you. 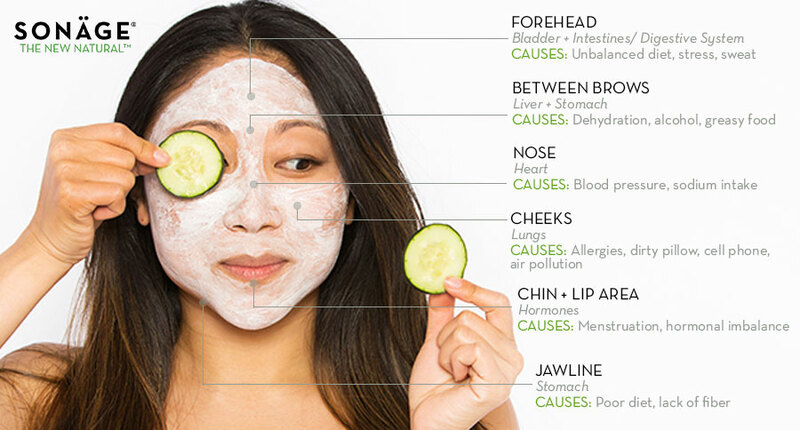 Face Mapping can help you pinpoint what’s going on in your body by analyzing where your breakouts are occurring. Sound confusing? Maybe a little at first, but it’s simple. The ancient Chinese medicinal technique of Face Mapping dates back to several thousands of years ago, and uses your face as a literal map to guide you to where the issues lie. The concept of face mapping has evolved over time, but the core idea still seeks to view your breakouts as a reflection of what is happening within your body. Face mapping connects areas of your face to a specific organ or body part — helping cure breakouts from the inside out. Digestive Issues: forehead acne can be attributed to various digestive issues. If your forehead breakouts are consistent, your pimples could be warning you to watch your diet for foods that are especially triggering. Make sure to drink plenty of water, and some green tea, to flush out toxins in the body. Stress and Sleep: With summer ending, it’s understandable that the change in season will bring about schedule changes, life stressors, and a lack of sleep. Balance these symptoms by finding a stress reliever, like exercise or yoga – just remember to avoid working out with makeup on to make sure not to clog your pores (and bring along Facial Rinse for a post gym refresher.) Try your best to get a full 7-9 hours of sleep per night, getting into an activity routine and setting a bed time can help you lock out those breakouts. Diet Related Issues: Diets too high in fat or that consist of too much processed foods can cause small oily breakouts between our eyebrows. We’re all guilty of splurging every now and then – but consistent breakouts in this area may be telling you to change up your diet and increase your fruit and vegetable intake, incorporating high fiber foods! And of course – drink water! Indigestion & Poor Circulation: Acne and oiliness on the nose can be connected to your heart and stomach. To fight back, try eating less seasoned and spicy foods, and again water, water, water! Upping your Vitamin B intake can also help alleviate acne in this area. Imbalance in Liver & Lungs: Breakouts on the cheeks are a bit more complicated to pinpoint, but experts advise to maintain a healthy liver and lungs, and it’s important to cut back on alcohol consumption and increase fruit and vegetable intake. Another important step – keep up with a regular physical activity routine! Dirt & Pollution: Dirt from items we use everyday has a big effect on the breakouts on our cheeks. When we talk on our cell phones, our breakouts talk back! Our phones usually go everywhere with us, so no surprise here – we transfer dirt and bacteria from the screen, onto our faces. Fight back against those breakouts by wiping down your screen with a disinfectant wipe for electronics daily – or even better, after each use! We can also take precautions against breakouts on our cheeks by washing our pillowcases regularly since they tend to get the most face time. Hormones: While some breakouts along the chin can be caused by stomach or kidney issues from greasy foods or dehydration, we can largely blame our reproductive organs for these pimples! Breakouts on the chin and lip area are a symptom of the menstrual cycle. There’s not much we can do to avoid the natural effects that our hormones bring, but if you are anticipating your period, be diligent and pay extra attention to your skin by taking the time to exfoliate. It’s also important to avoid resting your chin in your hands (I know it’s hard, I was guilty of doing it right before typing this), to avoid transferring oil or dirt from your hands to your face. Hygiene & Stomach: Skincare isn’t always simple, but jawline breakouts are just that. These breakouts are mainly caused by dirt and greasy foods. It’s important to keep up a regular skin care routine, and not touch your face before washing your hands and Lymphatic Massage, of course! And, as with most breakouts, be sure to watch your diet and try to stick to whole foods and well-balanced meals. Of course, the Face Mapping method isn’t full proof – but if you’ve tried your best to keep up your skincare routine, and spot treatment after spot treatment can’t seem to help lock out those breakouts, it may be time to take a deeper look at those pimples and get rid of them once and for all from within. 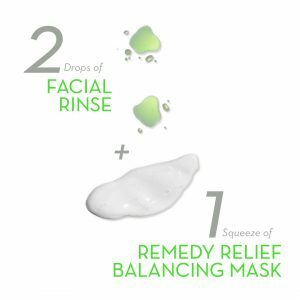 Bring the spa home and mix 2 drops of Facial Rinse with 1 squeeze of Remedy Relief Balancing Mask for a super cooling treatment. Over 15 different botanicals work together in Facial Rinse to reduce redness and calm the skin. Remedy Relief has 3 different clays rich in minerals to detoxify and reduce oil production.